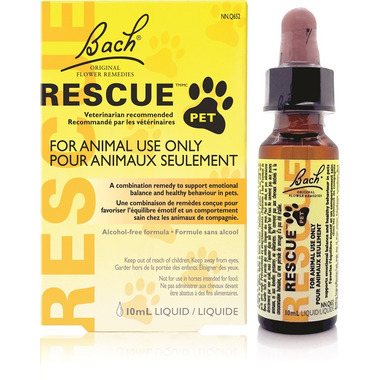 The Bach Rescue Remedy Drops Pet are able to help our animals when they have negative emotions just as they help us when we are emotionally out of balance. Unfortunately, we are not able to ask our pet why it acts depressed, but we do know if it misses a friend or gets overly excited around new people and that is how we select the correct remedies for our animals. Look at the chart below and you will be able to find the correct remedy for your pets situation. We use this for our three middle-aged and elderly cats, it helps to keep them stress-free. I have 3 fur babies, one dog and 2 cats. One of my cats is very allergic. Sheâ€™s also compulsive about grooming. I put drops in the community water bowl and have noticed a remarkable improvement ! Hooray no more steroids! So far so good and the rest of the quadrupeds are doing well as well. Iâ€™ve used rescue remedy for humans and it works well both the drops and the cream but Iâ€™m really really pleased with the rescue remedy for animals I highly recommend it. My cat gets stressed when I leave for holidays and this makes her much easier to handle for the pet sitter. Works better for our cats if a drop or two is placed on a treat or in the food bowl. I used as instructed and it did not work, maybe because my dog is too large? It did make him very dehydrated though. I am really impressed with this product. I have a very anxious bulldog and this helps to calm her down. 4 drops in the water bowl, or on top of a treat really helps her to settle. I have applied it a couple times in a small amount of time when she is very uneasy, and it has really helped. It doesn't upset her stomach or put her to sleep, but just settles her down. It's one of the only things I have found that does help. I have successfully used Pet Rescue on my miniature Schnauzer when his allergies make his paws and ears itchy and irritated. A few drops rubbed into those spots make a big difference. I've been using this for My 7 year old Boston Terrier who has always been a bit emotional and gets a little uneasy from time to time especially in the winter time when she not as active. It takes about a week to notice the difference in behaviour but this does really help make her feel more calm and balanced. I also have 2 other small dogs that may drink from her dish sometimes, and I have also noticed that they aren't so quick to bark at every noise they hear from outside which is an added bonus. It also didn't upset their stomachs. I will be purchasing again. Over the years, we have become a retirement home for senior dogs. Most come through rescue with shaky or unknown histories. This helps them relax and settle in immensely when used on a regular basis. Didn't realize how effective this product is, until I missed a couple of days. Very good results when used on a regular basis. It is clear and odorless and with a drop on my kittie's food, she never seems to notice it. So easy to give her this and she is vomiting a lot less. I will be buying the 20 ml bottle next time. When another product, recommended by the vet, didn't work, I tried this and it has helped my cat. She is a purebred diva and her high-strung personality was contributing to health issues. It is a small bottle and I will be ordering more but it has been very helpful and I feel comfortable knowing it is an herbal solution rather than vet-prescribed medication. I used this on my scaredy cat and it did nothing. The small bottles did not even last a month. I can't blame this product for not working because I've tried other alternatives and it was the same. This works well for my cat! He's more cuddly and calm. I put it in his water fountain, I just wish the bottle was bigger! My senior dog started to get anxious when we'd leave for the day to do errands, despite having had this occasional routine for years. We'd come back and she'd be wired to the nuts and bouncing off the walls. Gave her a few drops in her water before we left, and she didn't seem bothered at all. When we got back she happily greeted us at the door like she used to! I'm very happy with these drops. I was worried they'd leave her a zombie or seem drugged, but they didn't. They just helped return her to her happy loving self. This stuff works great! This limits the barking, drooling, and whining of my anxious dogs when we have guests over. I have yet to try it during a thunder storm, but I'm sure it help then as well.